"If my wife is watching, you need to milk the cows - I'm going to the pub," says jubilant Bryne FK supporter. 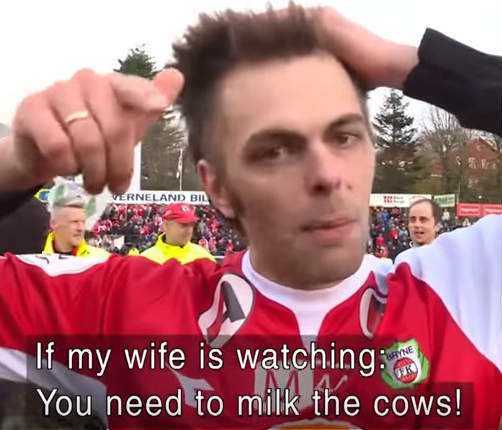 Watch the moment a supporter of Norwegian 2nd division side Bryne FK goes on TV to ask his wife to milk the cows so he can celebrate his team’s survival at the pub. Having seen his side manage to beat the drop with a nervy 2-1 final day win over Bærum, the exhausted-looking fan caused much mirth with his televised request for a temporary reprieve from cow-milking duties. Apparently he had to do it the next morning, very possibly with the mother of all headaches to accompany him.